This article is the first of a series that provides ongoing analysis of the changes made to Carl Icahn’s US stock portfolio on a quarterly basis. Carl Icahn consistently figures prominently in the list of the greatest investors of all times. He is known for his ability to spot public companies that will benefit from changes at the top and relentlessly going after them in his role as an activist investor. His style of operation is pretty intimidating and usually starts out by taking a minority stake but that can quickly escalate to a proxy battle, if management fails to go with his demands. The US long portfolio shrunk by ~16% this quarter from over $11.65B to ~$9.77B mainly because of a couple of liquidations as a result of deals that paid-off handsomely: Carl Icahn made over 55% in a period of less than six months on his $1.2B investment in El Paso when Kinder Morgan offered $26.87 per share in February 2012. Previously, Motorola Solutions (MSI) bought 23.7M shares of its own stock that Carl Icahn held for $49.15 netting a large profit for Ichan - Motorola stake was established in 2009 - he was instrumental in splitting up Motorola into two - Motorola Mobility Holdings (MMI) and Motorola Solutions (MSI). Bullish: Ichan increased his stake in CVR Energy Inc (CVI) by over 230% this quarter. Since then he acquired an 80% stake through a $30 per share tender offer in May 2012. He has plans to sell the company at $36 per share and has hired Jefferies & Co (JEF) to assist in the process. Icahn kept his large stakes in Federal Mogul and Forest Labs (FRX) steady indicating a bullish bias. The WebMD (WBMD) stake was also modestly increased indicating a mild bullish bias. 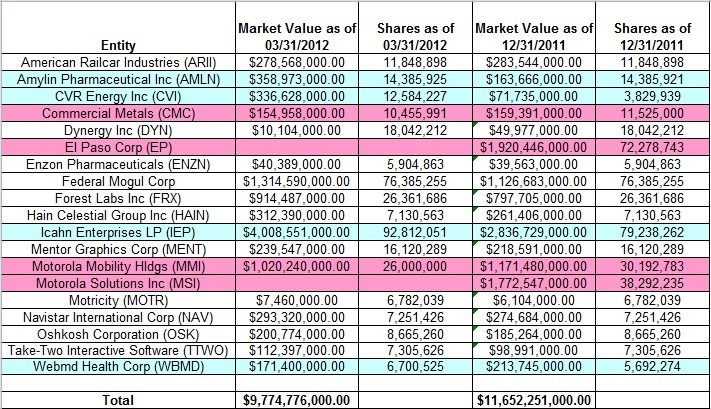 Bearish: Icahn's portfolio shows modest reductions in his Commercial Metals (CMC) and Motorola Mobility Holdings (MMI). The ~10% stake reductions indicate a mild bearish bias.